Well, I didn't actually move up ... 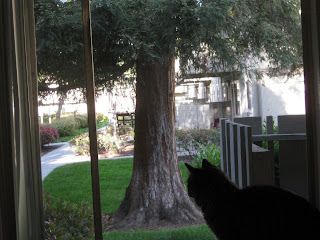 I moved from a teeny-tiny upstairs apartment to a nice size downstairs apartment with a redwood tree outside my front door. Here are some pics of the new place. It looks a little bare because I haven't finished unpacking and I don't have enough furniture to fill it yet. The kitchen has a new oven, and I think the cabinets might be brand new, too. I absolutely love them-- my old cabinets were dark, crumbly particle board. The dining area looks pretty empty. But at least I have a dining area! The shower door is 100% mold free! Oh, I'm so spoiled. I like the faux tile floor in the kitchen and bathroom. It actually feels like stone on my bare feet. This bedspread was crocheted by my great-grandmother. It was stuffed in a closet for many years and was all dusty and smelly. I had it dry cleaned and now it's beautiful. Charlie decided to take a snooze on the bedspread because I specifically told him to stay off of it. The cats aren't used to seeing people walk by outside, so they're constantly running and hiding because they think we have visitors. But overall they seem to like having more room to romp and play. I love being able to chase them around the apartment. Hopefully I'll post more pictures at some point in the future when the place is unpacked and decorated. Congratulations on the move and more space!